Delegates: Arthurian Legends in Wales and BeyondBuilding on a portfolio of long-standing international research collaboration, and sponsored by IMEMS (Institute for Medieval and Early Modern Studies, Bangor University and Aberystwyth University), the Centre for Arthurian Studies’ day symposium, ‘Chwedlau Arthur yng Nghymru a thu Hwnt / Arthurian Legends in Wales and Beyond’, took place on Thursday 28 June 2018. The theme of the symposium was reflected both in the broad geographical, multilingual, and period framework for the development of the Arthur legends, and in the participants’ international affiliations. 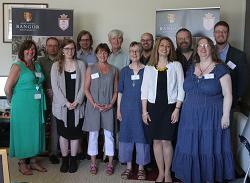 The research focus of the event was anchored in the Welsh Arthurian traditions, and the conference proceeded mainly chronologically, beginning with a panel focusing on the medieval Welsh tradition. Dr Owain Jones (Bangor University) opened the day by considering how an early vernacular chronicle provides insights into the understanding of, and use of, legendary Arthuriana: ‘Y Gorffennol Arthuraidd yng Ngwynedd y drydedd ganrif ar ddeg/ The Arthurian past in thirteenth-century Gwynedd’. Prof. Barry Lewis’ (DIAS) then gave a detailed study of the complex ways in which ‘Arthurian’ elements feature in the imagery and tropology of medieval poetry across a number of genres, in ‘Byd Arthur fel delfryd yng ngwaith y beirdd canoloesol / The Arthurian world as an ideal in medieval Welsh poetry’. Closing the session, Dr Simon Rodway (Aberystwyth University) dived into the prehistory of the ‘oldest’ Arthurian tale, considering its relationship with orality, mythology, literacy and history; his ‘Golwg ar ddatblygiad Culhwch ac Olwen / Exploring the development of Culhwch ac Olwen’, aimed to dispel a number of misunderstandings, including the ‘myth’ that this tale is a ‘myth’. The first part of the symposium thus brought together contributors to the forthcoming University of Wales Press volume Arthur of the Celtic Languages, co-edited by long-standing member of the Centre (and honorary fellow of the Institute for Medieval and Early Modern Studies), Dr Ceridwen Lloyd-Morgan, with Prof. Erich Poppe. In her keynote lecture, Dr Lloyd-Morgan (formerly Director of Manuscripts and Images at the National Library of Wales) took a comprehensive view of the growth and spread of Arthur’s appeal across the Celtic languages in general: ‘Arthur yr Ynysoedd a'r Cyfandir: Edrych eto ar lenyddiaeth a thraddodiadau Arthuraidd yn yr ieithoedd Celtaidd / Insular and Continental Arthurs: Revisiting Arthurian literature and traditions in the Celtic languages’ was a rich and wide-ranging tour of Arthurian texts and scholarship, placing much of the day’s work in essential context. The afternoon provided an opportunity to open up research avenues into the twelfth-century best-selling Historia regum Britanniae, in which Geoffrey of Monmouth presented Arthur as a king – and ‘international superstar’. Metaphorical genealogy in the Historia formed the subject of Bangor University PhD student Audrey Martin’s presentation, ‘The heroic family tree of the Historia Regum Britanniae’. Arthur’s trajectory was then traced through the centuries in another medieval best-seller, the fifteenth-century English language compendium of the rise, life and death of Arthur and his Round Table fellowship in Thomas Malory’s Le Morte Darthur; this was presented by Emeritus Prof. P. J. C. Field, one of Bangor University’s leading scholars in Arthurian studies over the past 50 years, and formerly president of the International Arthurian Society (http://www.internationalarthuriansociety.com). The second panel of the symposium concluded with another presentation by a Bangor University PhD student, Ashley Walchester-Bailes (funded by the prestigious Drapers’ Company Scholarship, and one of the first PhD students to be formally associated with the Centre for Arthurian Studies); his project encompasses the revival of authorship and the making of modern editions of Malory’s Morte, and he presented ‘Malory’s ‘great raft’: Edward Strachey and the Morte Darthur’. The third and final panel of the symposium brought together papers arising from recent research on post-medieval Arthurian traditions. Dr Kristina Hildebrand (Halmstad University, Sweden) a recent visiting research fellow of the Centre, discussed the work of the eighteenth-century author, Charles Bertram: ‘Bertram and Nennius: sources, editions, forgeries’, while Prof. Sioned Davies (Cardiff University) presented a fascinating paper on illustrations to Charlotte Guest’s translations of the Mabinogion in rare early editions: ‘“A most venerable ruin”: word, image and ideology in Guest’s Geraint’. The symposium ended with Scott Lloyd (RCHMW; member of the Centre) presenting a paper on the relationships between popular and academic approaches to the Arthurian legends: ‘Academic vs. popular: the relationship between two different views of King Arthur and Wales’. Several papers presented at the event drew both on rare materials from the Centre’s Arthurian collections and records from the Archives of the International Arthurian Society, now placed in the custody of the Centre. Attended by over forty staff, students and affiliated members of the community, the symposium paves the way to further scholarly exchanges and engagement with key topics of interest in Arthurian and Celtic studies. The co-organisers, Centre’s director, Prof. Raluca Radulescu, and deputy director, Dr Aled Llion Jones, would like to thank Shan Robinson, Bangor University Library and Special Collections officer, for her invaluable collaboration and support, the administrative staff in the College of Arts and Humanities, and Chris Drew, manager of the Strategic Alliance (IMEMS), for assistance in making this event a success. If you are interested in finding out more about the Centre’s planned future activities, please register on our ‘Join our mailing list’ page.